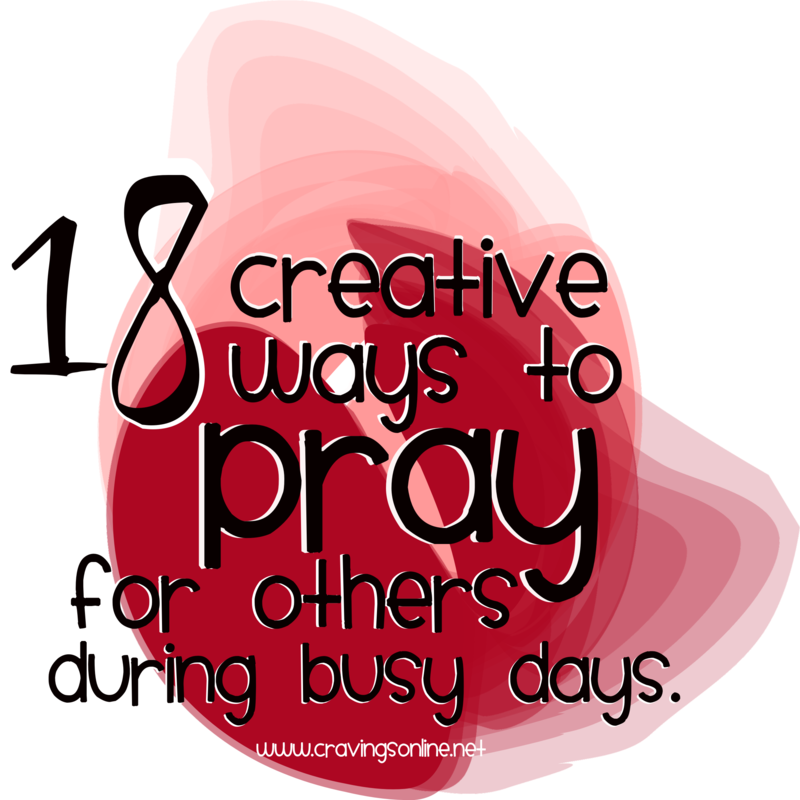 18 Creative Ways to Pray for Others. God and I talk all day long but if I am honest those conversations are about me, my husband, my kids, my immediate family, my work, and finances. That is an awful lot of ME going on. In the busyness of life I don’t take the time I should take to be in prayer for others and this world. If I am going to make changes in my prayer life then I need to put something tangible in place to be my helper. I decided to take simple tasks that I do daily or at least frequently and associate them with things and people I want to be in prayer for. How about you? Is praying for others easy or something that goes on your back burner? Shower : Prayers for family member who don’t have a relationship with Christ. Hopefully that doesn’t sound too weird but I am reminded of baptism when I am in the shower so my brain links it that way. Brushing Teeth: Prayers for parts of the world without fresh water. Playing baby dolls: Prayers for orphans and foster children around the world. Cooking : Pastors and church leaders as they “cook” up their message and lessons for the week. Signing things such checks, forms, or paper work: Prayers for our world leaders. Driving : Prayers for workers like firefighters, police, and paramedics who risk their lives daily on the streets. Dishes : Prayers for our military and those away from home who are wishing for simple things like a home cooked meal. Laundry : Prayers for workers in sweat shops who are not getting fair wages for their time and efforts. Watching TV: Prayers for the entertainment industry. Putting on my make-up: Prayers for women who are stuck or trapped in the adult “entertainment” industry or feel there is no way out of an abusive relationship. Putting away clothes: Prayers for anyone who will be sleeping on the streets tonight. Putting away the groceries: Prayers for Food for the Hungry, Kids Against Hunger, Compassion International and those who are on a mission to make sure every child has a meal tonight. Shopping: Prayers for Operation Christmas Child and Angel Tree who hope to bring a bit of joy to a child during the holidays. Putting on shoes: Prayers for Sole Hope and organizations who bring shoes and education to children who are without basic needs. Changing my purse: Prayers for Freeset and Mercy House and organizations that help give women hope through teaching them a trade they can live by. Playing Legos: Prayers for Habitat for Humanity and organizations who build homes for others. Getting my kids ready for bed: Prayers for Invisible Children and organizations that are helping to fight for the rights of children being taken and forced to be child soldiers. Crafting: Prayers for teachers who are inspiring the next generation. What would your list looks like?